Our passage from Madagascar to South Africa was both uneventful and remarkable. We made the 1,242-mile passage in just slightly over 8 days, arriving in Richards Bay very late in the evening on the 4th of July. We had a mixed bag of conditions ranging from flat calm to 35 knots but no rain or storms. The remarkable portion of the trip, as we were told by others, was that we were able to make it without stopping to allow weather systems to pass, which is the usual situation when transiting the Moçambique Channel in the dead of winter. Several of other boats in our ‘fleet’ had to take refuge in poorly protected areas while the low pressure cells marched up the Channel. After securing a berth at the Zululand Yacht Club, we arranged to have Rutea hauled out. Since we were planning on spending time in California, we prefer to have the boat out of the water as it typically means there are less potential problems. The operative word here is ‘typically’ as the haul-out facilities at Zululand Yacht Club are primitive at best. Unlike all the other yards at which we’ve hauled, Zululand uses a series of wooden poles to support the boat (they’ve only lost one boat, they report). I begged for something more substantial and was able to secure four heavy steel supports that gave me more confidence that the boat would be okay while we were gone. Once on the hard, we promptly scheduled a trip to the nearby game reserves of iMfolozi and Hluhluwe with our friends, Invar and Seija on the 39’ Hallberg-Rassy, Marieke III. The accommodations at Hilltop Camp in the middle of the reserve were terrific (considering the location) and we saw lots of game, exceeding our expectations. While we were still in Madagascar, we broke one of our cardinal rules: Never Set a Deadline While Cruising. However, when we stumbled across very low fares from Durban to San Diego with a very convenient stop in the UK, we couldn’t resist. Lucky for us we were able to make the flights without any problems but we scolded ourselves roundly just the same. Our visit home was absolutely delightful, our stop in the UK to see Ian and Sean unforgettable and our side trip to Denver to see Taylor and Ken was magical. Before we left San Diego, we celebrated a world-class Thanksgiving, albeit a month early. Once back aboard Rutea, our priority was to get her back in the water so we could start planning our trip around the southern end of South Africa. Careful planning is required as the weather at this latitude can be extremely rough – they don’t call it the Cape of Storms for nothing. Part of the problem is the Algulhas Current, which runs south from the Moçambique Channel at up to 7 knots and meets the ferocious southwest winds that come up from Antarctica. This can create very big seas and even ‘rogue waves’, hence the other name for the stretch of coast line: The Shipwreck Coast. 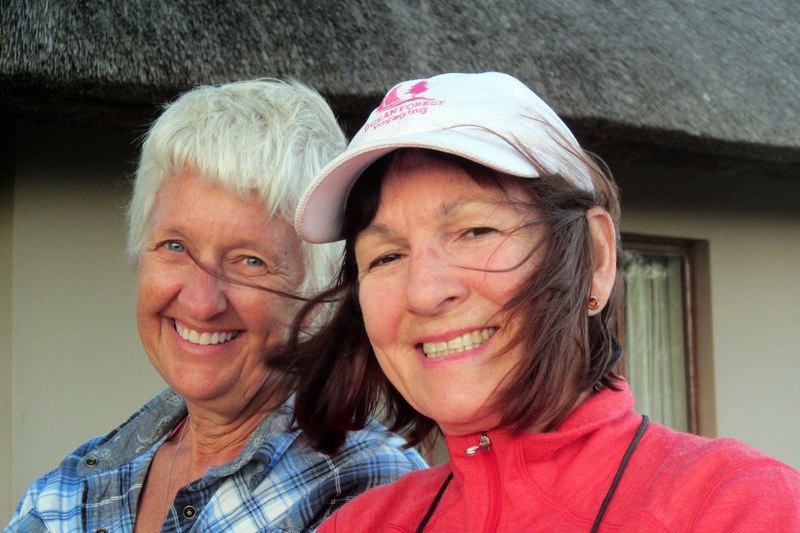 Before we left Richards Bay, our very close friends, Beth and Norm from Vancouver, made the extremely long flight to visit us. We have indelible memories of cruising with them in the South Pacific and having them aboard Rutea was a special treat. Not only are they expert cruisers but they’re fun, warm and very generous. Mark and Rosie from Merkava joined us for another safari to iMfolozi and Hluhluwe Game Reserves – the six of us together was just way too much fun. We had the ‘privilege’ of experiencing some of the winds that we were concerned about. At one point, we saw a gust to 52 knots but the Harbor Control in Richards Bay said they saw 65. The neighboring marina at Tuzi Gazi was loaded with foreign boats and many of their docks couldn’t handle the combination of the yachts and wind – several of the docks buckled and some boats were damaged. When a weather window opened that we felt comfortable with, we left Richards Bay with some regret. We felt very safe in Richards Bay as it’s primarily a small industrial port with very little crime. Still, we were warned never to walk outside at night, only select a taxi with a white driver and avoid large groups of blacks. It was horrifying to us that this level of racism existed in a first world country and we were never sure if this was just ‘talk’ or if we were actually in danger if we didn’t follow the advice. We do know that the crime problem in South Africa is horrendous and it takes a level of awareness that exceeds what we’re used to in Southern California. Regardless, leaving Richards Bay on the evening flood tide, we soon found a northerly breeze that allowed us to head first south and then southwest. Skipping Durban, we made our way to East London, where we arrived about 48 hours later, dropped our hook and took the dinghy into the local yacht club. 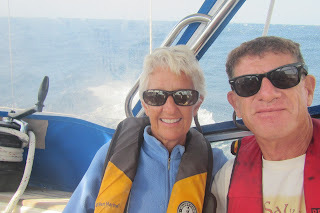 Here we were again given warnings about safety and precautions but we felt pretty comfortable where we were anchored. 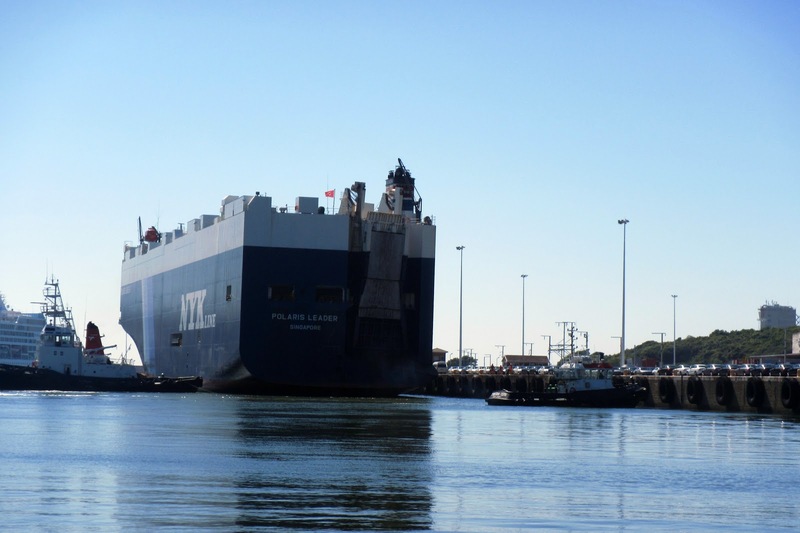 East London is a good-sized city and the secure harbor is where the local Mercedes-Benz manufacturing facility loads the C-class cars onto a specially-designed freighter for their transportation to the USA. We watch as thousands of these shiny beauties were driven onto the ship in an extremely well-coordinated fashion that took all of a single afternoon. Once another weather window opened, we made our way to Mossel Bay, arriving in 30 knots of southeast wind. The anchorage in Mossel Bay is very exposed to any wind with an easterly component and we knew we’d be miserable at anchor. When I called Port Control for permission to enter, I asked if there was any place for us inside the breakwater, which is reserved for fishing vessels. Much to my surprise, Port Control said to come on in and they’d make a space for us. It was no easy task to maneuver Rutea close enough to the huge concrete jetty with the large tractor tires being used as fenders but what was harder still was for Ruthie to get from the deck onto the jetty or even one of the tires while holding onto a dock line. Fortunately, a police van had driven out on the jetty and four big, strong policemen grabbed our lines – at the time, we didn’t know they had come out to check our passports and visas. They were very nice and told us that Mossel Bay was a very safe town. Our good friends on the Najad 38, Amigo, , rafted up to us shortly thereafter – all four of us felt smug that we were in a safe, calm harbor while the wind raged. The town had a nice charm to it with many restaurants and even a worthwhile museum that housed a replica of the ship that Bartolomeu Dias sailed from Portugal in 1488, becoming the first European to sail around south Africa. Since the wind had changed to its prevailing direction of westerly and Port Control needed the space on the jetty we were occupying, we moved out to the anchorage, which, by this time, was fine. It was comfortable enough that Helga, René, Ruthie and I decided that it would be okay if we left the boats at anchor and did some sightseeing. 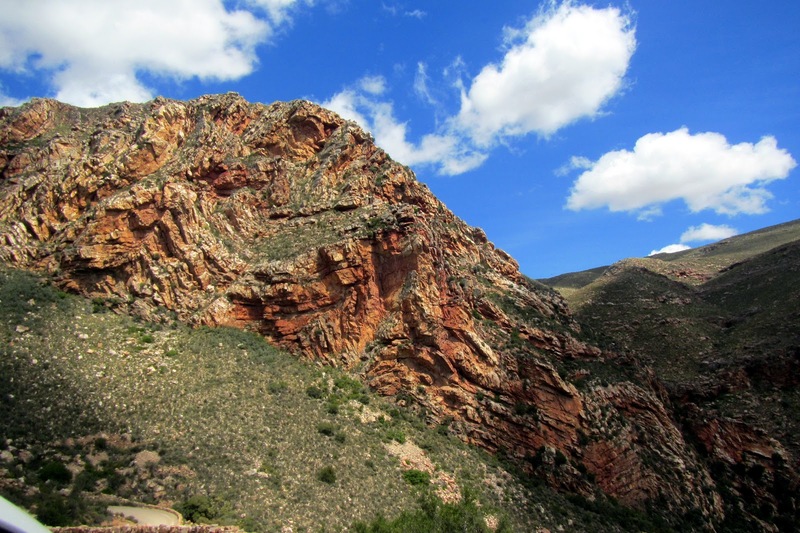 We rented a car and drove over the spectacular Swartberg Pass and spent the night at a quaint bed and breakfast in Oudtshoorn. About six cruising boats had gathered in Mossel Bay and even though we were thoroughly enjoying the warm hospitality of the Mossel Bay Yacht Club, we all needed to move on. After watching carefully for another 48 hours without any westerly winds, we weighed anchor early on the 13th of December and steamed out of Mossel Bay. Our course would take us around the most southern point of Africa – Cape Agulhas – and it has a nasty reputation. As it turns out, we needn’t have worried. There was no wind at all and we wound up motoring almost the entire way to Simon’s Town in False Bay. Mark and Rosie from Merkava were standing on the dock at the False Bay Yacht Club, ready to catch our dock lines. It was wonderful to rendezvous with them again and we made plans to spend Christmas and New Year’s together. They had rented a car so we went on many expeditions with them, seeing sights, buying boat parts and tasting wine. Not only does South Africa produce some fabulous wines but the exchange rate of about ZAR15 equaling one US dollar, makes them a bargain. Very good wines can be purchased for under 40 rand – at the current exchange rate, that’s about US$2.45. 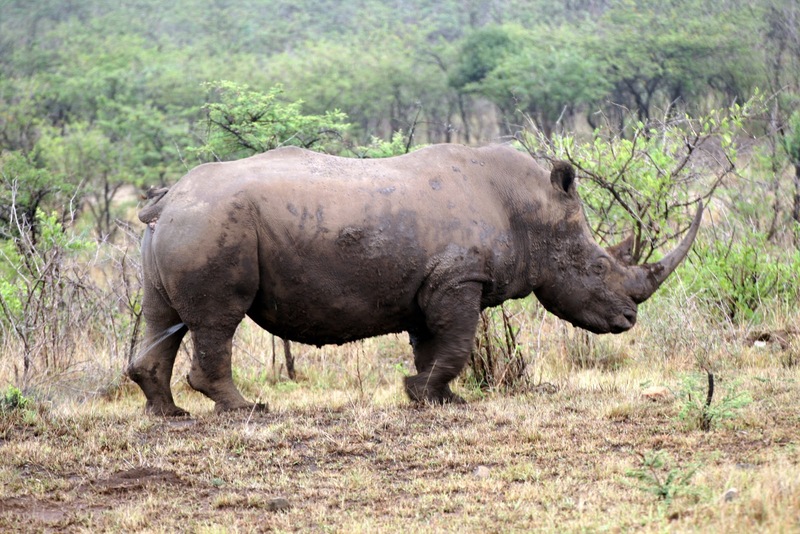 In fact, this made visiting South Africa an amazing value. I know people thought I was crazy when I would tell the bartender to keep the change when I bought a ZAR13.50 beer and offered a 20-rand note – way too big of a tip! But, hell, I thought, the beer was only 82 cents American and the tip was less than 40 cents! I shudder to think about what would happen to me if I left a 40-cent tip in the US! My sympathies go out to the South African people who’s currency has devalued so badly but it sure makes visiting South Africa desirable for North Americans or Europeans. 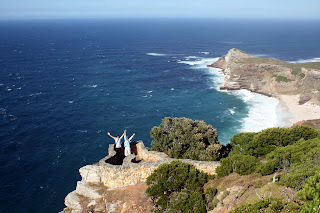 We eventually left all our cruising friends at the False Bay Yacht Club and made our way around Cape Point and the Cape of Good Hope, getting a berth at the Royal Cape Yacht Club. Here we’re making the final preparations for our next passage which will be to Namibia. The wind howls here, for weeks on end, and 30- to 40-knots is common. We’re looking for a lull so we can get Rutea out of the marina without hitting anything! Great great summary of SA Neal. You & Ruthie did and saw so much. We had so much fun visiting you in SA. We will treasure the memories always!